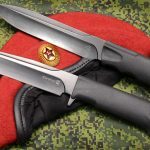 Tactical-Life takes a look at the knives used for not only ceremony, but as implements for silently eliminating enemies, by Russia's elite operators. Russia’s Special Forces, or Spetsnaz, faced new challenges after the war in Afghanistan, the end of the Cold War and the breakup of the Soviet Union. Like U.S. special operations, Spetsnaz units are now involved in counterterrorism and counterinsurgency. However, they retain their traditional “hot war” missions of sabotage, surveillance and disruption. Spetsnaz units have focused on operations in Syria, Chechnya and other areas of conflict. Reportedly, these have included counter-piracy missions in Georgia and Ukraine. Security at the Sochi Winter Olympics also fell under Spetsnaz purview. Russian special operations forces have reorganized for their current missions. In the Soviet Union, Spetsnaz units were normally under the GRU (military intelligence) with specialized Osnaz units under the KGB. Descendants of the Osnaz, such as FSB Alpha and FSB Vympel, remain under control of the KGB’s successor and act as the Russian Federation’s national counterterrorism units. The Ministry of the Interior has Spetsnaz units as well. Military Spetsnaz, still under the GRU, are now organized under KSSO (Special Operations Forces Command), the Russian equivalent of USSOCOM. As with western counterparts, there is specialization within KSSO Spetsnaz units: HAHO and HALO parachute insertions, clearing and seizing important buildings or facilities to rescue hostages, mountain operations in rough terrain and Arctic conditions, and maritime operations with combat swimmers and amphibious operators. 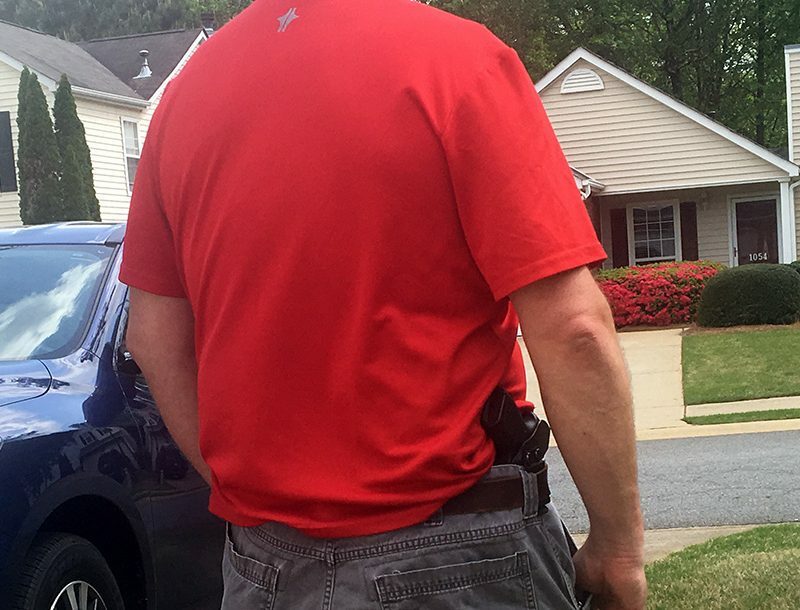 There are also dignitary protection specialists. Depending on the mission, specialists from different units can be combined to form a composite task force. Despite evolving missions, the Spetsnaz have continued to emphasize martial arts training. 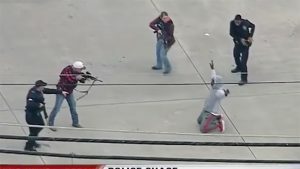 Systema is the Russian military martial art that stresses practical combat techniques. 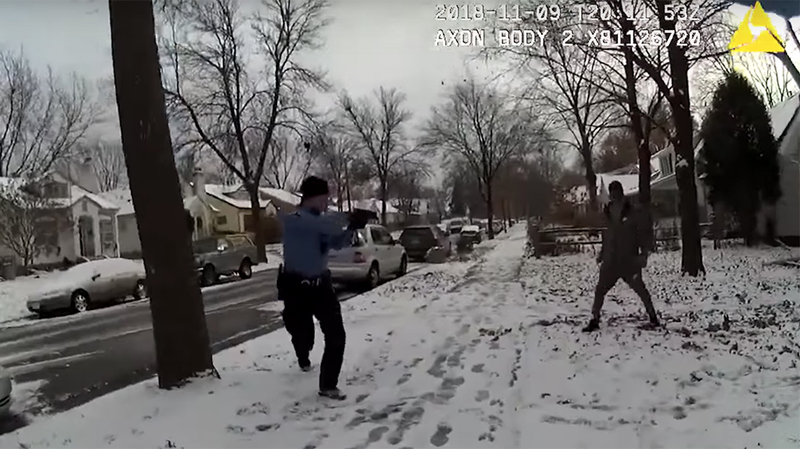 In addition to unarmed techniques, Systema teaches the use of edged weapons, impact weapons, improvised weapons and firearms. This training in edged weapons has influenced the Spetsnaz to adopt a variety of high-quality combat cutlery. Though not strictly a blade, one of the best-known Spetsnaz edged weapons is the entrenching tool—usually the Russian standard-issue MPL-50. Highly versatile, the MPL-50 may be used as a spade, an axe, a hammer, an oar or a frying pan, or for measuring dimensions since it has a standard width and length. Although Spetsnaz units may use the MPL-50 for any of these tasks, they also train with it for close combat, even practicing strikes and parries from knives and bayonets. Spetsnaz operators also become proficient with the MPL-50 as a throwing weapon to at least 10 meters. A fighting knife is a very personal weapon designed to eliminate an enemy up close. As a result, many elite military units have a tradition of issuing a special blade to those who pass a rigorous selection course. Other units allow operators to purchase their own close-combat knives. Within Spetsnaz, both traditions seem to exist.To some extent, the knife chosen will depend on the operator’s mission. For example, Spetsnaz whose primary mission is reconnaissance may have more use for a general-purpose survival knife than for a pure combat knife. Those with a raiding mission will value a close-combat knife to eliminate enemy sentries. Often, a survival/fighting knife offers a compromise. Whatever the needs of the Spetsnaz operator, a quality blade is available within the Russian Federation, and knives from Kizlyar in Dagestan are especially valued. Though production knives, Kizlyar blades are produced to a very high standard. They are intended to last the operator his entire service life and then be handed down to a descendant. Just as a side note: One high-profile fan of Kizlyar knives is Vladimir Putin, who has been photographed carrying one on fishing and hunting trips. Spetsnaz operators seem to prefer a couple Kizlyar blades in particular: the Korshun and the Bopoh-3. Both of these fighting knives are light and handy yet durable. The Korshun has a subtle 6.5-inch clip-point blade. One combat version has a half-crossguard and an Elastron rubber-reinforced polymer handle. The Korshun’s spine has a serial number, presumably to track when it was issued. The blade’s non-reflective matte finish is a desirable feature for a spec-ops knife. There are thumb recesses on either side of the handle near the ricasso for those who use a modified saber grip. There are also grooves atop the handle for those who use the standard saber grip. And, for those who use the reverse grip, the bottom of the grip is dished out behind the crossguard. The ABS plastic sheath has both friction and snap retention. A variant of the Korshun has saw teeth on the spine, presumably for use in a survival situation. The Bopoh-3 has a 6.5-inch blade that is almost a spear point for good penetration against an enemy wearing heavier clothing. There is no crossguard, and the handle is made of rubber-reinforced polymer. The grip is well shaped for various holds, including the reverse grip favored by some Systema techniques. A lanyard may be attached to the hole in the protruding tang, which may also be used as a skull-crusher. The Bopoh-3’s ABS plastic sheath offers good retention and can be affixed to gear in various places. One other variation should be mentioned. The Alpha has a titanium-coated D2 steel blade with or without serrations. Its name resembles the FSB’s elite Alpha counterterrorism unit. It may also see use with Delfin combat swimmers—Russia’s equivalent to the U.S. Navy SEALs. 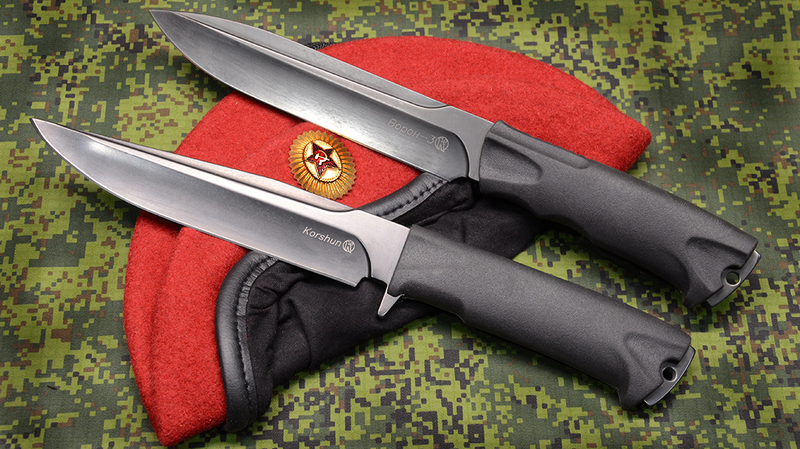 One of the most interesting Kizlyar knives was designed for Spetsnaz units that carry out reconnaissance and counterinsurgency operations in heavily wooded or mountainous areas. 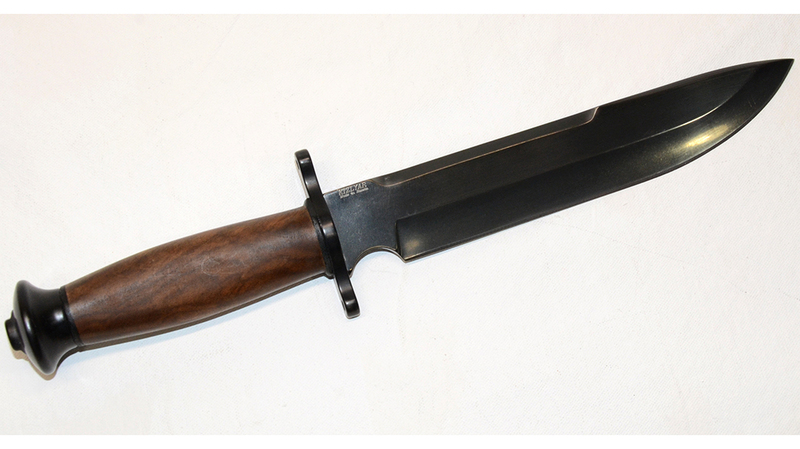 The Kizlyar DV-2 is a big knife at 14.5 inches long with a 9.3-inch blade. Primarily designed for situations where an operator will live off of the land, the DV-2 is heavy enough for hacking apart an animal after killing it or chopping limbs or branches for a fire. The knife features an area atop the blade designed for hacking. The wooden handle is smooth and thick enough to allow a good grasp when wearing gloves or mittens. Other outdoor/survival touches include a crossguard with holes to allow lashing the DV-2 to a pole for use as a spear and a pommel heavy enough for light hammering. The blade is 0.215 inches thick to withstand hard use. Although the DV-2 balances well and its clip-point blade could serve in combat, this knife excels in utility/survival use, as Spetsnaz close-combat blade-wielding techniques require a lighter, slimmer weapon for greater hand speed. The DV-2 features a heavy-duty leather sheath with two snaps for retention. Spetsnaz operate in Africa and other areas where a machete is useful. Their machetes have evolved over the last half-century, though they have maintained their versatility. Spetsnaz machetes are typically as long as traditional jungle machetes, though early models were relatively short and heavy to be more effective for hacking. One early Spetsnaz machete had a hollow handle to hold matches or other survival items. Traditionally, Spetsnaz machetes have incorporated a flat tip for prying. Kizlyar produces an updated Spetsnaz machete called the Alligator. Older Spetsnaz machetes featured saw teeth on the spine, but these have been eliminated. 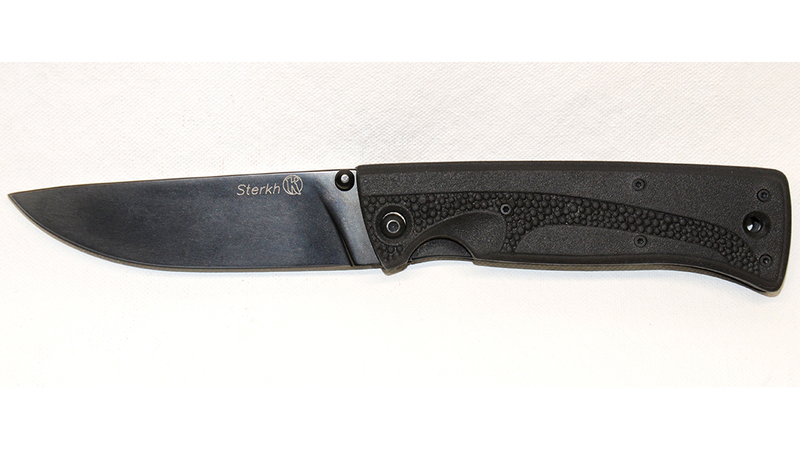 The 10.4-inch, Z90 steel blade is slimmer, and the handle is more ergonomic. A pry edge remains, while the blade is designed to put more weight forward to deliver a more powerful chopping blow. Weighing 1.5 pounds with an overall length of 16 inches, the Alligator carries easily and its black leather sheath allows fast access. The Alligator swings with enough power to be devastating against an enemy. Russian Spetsnaz units use multi-tools as well. One is the Werewolf-2, which is actually a butterfly knife. When opened in one direction, it gives the user a 4.5-inch drop-point blade but, when opened in the other direction, offers tools, including saws, a can opener, a bottle opener, a screwdriver and an awl. Some Spetsnaz also use the general-issue 6E6 Ratnik multi-tool, which incorporates a knife blade, a saw, a screwdriver and very sturdy pliers. Some Spetsnaz operators also carry folding knives depending on their missions. The Sterkh from Kizlyar is typical. 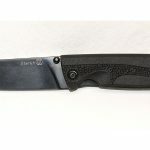 Also, with a 4-inch drop-point blade and liner lock, this folder would seem familiar to American troops who use a Benchmade or other medium-sized folder. Other Spetsnaz blades include ballistic knives that were designed to shoot the blade at an enemy, or the NRS-2, which combined a knife with a single-shot mechanism to fire the 7.62x42mm SP-4 cartridge developed for the PSS silent pistol. These knives have seen at least limited use with some Spetsnaz units. Also, at least one former Spetsnaz operator I talked to about these specialized blades thought they had been developed for KGB Vympel (now FSB Vympel) when it had the missions of sabotage and direct action. 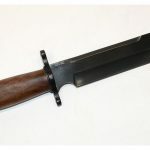 Special knives have marked elite military units since the British Commandos of World War II. For the Spetsnaz, though, it should be remembered that fighting knives are not just symbols. They are deadly implements for silently eliminating enemies in close quarters. This article is from the November-December issue of Tactical-Life magazine. Grab your copy at OutdoorGroupStore.com.